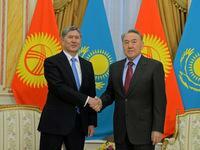 Kazakhstan and Kyrgyzstan maintain strong economic, social, and political ties. During Kyrgyzstan’s 2010 crises, Kazakhstan played a major role in achieving an initially peaceful political transition and then helped the country recover from the summer’s outbreak of mass ethnic violence (see EDM, May 17, 2010). Current trends suggest that this close relationship will deepen in the future. The two countries seek to increase trade flows and to implement new projects in the energy sector. They collaborate on security issues and maintain close social and political relations. Stability and development represent mutually advantageous goals for the two countries. Realizing the potential for increased economic ties between Kyrgyzstan and Kazakhstan partly depends on the internal environment present in Kyrgyzstan. In particular, Kyrgyzstan’s government will need to provide an environment conducive to foreign investment. The country faces a precarious economic outlook. The Pentagon is ending its use of the Manas air base next year (see EDM, November 13), and Kyrgyzstan will need to make up a significant shortfall in its budget. With a national GDP of only $6.5 billion, the end of the United States’ military presence will subtract nearly 2.5 percentage points from Kyrgyzstan’s GDP (Trend, October 18). Because of this, strong economic ties with Kazakhstan will acquire added importance. Kazakhstan is the largest source of foreign direct investment (FDI) in Kyrgyzstan, with many joint ventures in Kyrgyzstan in such sectors as banking, construction, and energy (AKI, November 1). In Kyrgyzstan’s banking sector alone, Kazakhstani capital comprised nearly 40 percent in 2012 (BNews, July 11). The two countries already maintain strong ties in the energy sector. According to the news agency KyrTAG (November 6), Kazakhstan will supply 30,000 cubic meters of gas to Kyrgyzstan daily by the end of 2013. There is also a discussion of building a new oil pipeline from Kyrgyzstan to Kazakhstan (Trend, June 28). In November 2013, Kazakhstan declared that it would be ready to consider the possibility of duty free oil deliveries upon Kyrgyzstan’s ratification of the 2011 Free Trade Zone Agreement (AKI, November 1). According to reports, Kazakhstan intends to build a 500-kilowatt Kazakhstan-Kyrgyzstan power line, which would run 400 kilometers and cost $210.3 million (AKI, September 6). Yet, the controversial 2007 parliamentary election, the 2010 mass ethnic riots, and the November 2013 government decision to float the idea of nationalizing a foreign-controlled gold mine continue to discourage FDI (RIA Novosti, November 7). In 2012, Kazakhstan’s FDI amounted to only $32 million (BNews, July 11). Another problem has been constraints on bilateral trade. In 2011, Kyrgyzstan was not even among the top 20 trade partners of Kazakhstan (Tengri News, October 25, 2011). In 2012, bilateral trade turnover rebounded to $1 billion, which represented a 41-percent increase from the previous year (Interfax, November 1). The two governments have recently taken measures to decrease non-tariff barriers to trade. In September 2013, Kazakhstan and Kyrgyzstan launched a joint border control checkpoint at Kordai-Ak-Jol, which aims to decrease the amount of time required to go through customs (Trend, September 26). Astana is now considering Bishkek’s request to lift restrictions on meat imports from Kyrgyzstan (AKI, November 4). Meanwhile, Kazakhstan has asked Kyrgyzstan to review a decision to cancel the licensing of the import of tobacco products (Central Asian News Service, November 4). While this initiative might represent more of an economic calculation, Kazakhstan and Kyrgyzstan display strong social ties given large numbers of Kyrgyzstani migrant workers in Kazakhstan—a number that has been growing in recent years due to the country’s booming economy. However, this large migrant population can be a source of conflict. Bilateral tensions have arisen in the way Kazakhstani authorities have deported the migrant laborers caught working illegally. In September 2013, Kazakhstan detained 14 illegal laborers who were citizens of Kyrgyzstan (Central Asian News Service, September 26). While only a minor incident, the detention highlights a problem that could arise if the migration flows are left unregulated. In addition, popular protests have occurred after Kyrgyzstan’s authorities ceded to Kazakhstan contested territories claimed by the Kyrgyz Republic (IPS, May 24, 2007). Looking ahead, Kyrgyzstan’s entry into the Customs Union, which includes Kazakhstan as well as Russia and Belarus, could further boost their bilateral economic ties, but its economic viability is strongly debated. According to reports released in November 2013, Kyrgyzstan will sign the road map to join the Customs Union within two months (AzerNews, November 12). Armenia and other Eurasian countries might also join in the future. The Russian government insists that Kyrgyzstan would realize tangible benefits through such economic integration (RIA Novosti, April 24). Critics see political motives behind the decision and question the economic benefits of joining the Russian-led economic bloc (see EDM, October 25). The Customs Union will likely dominate the fifth annual Kazakhstan-Kyrgyzstan Intergovernmental Council that will take place in 2014 in Astana.